Please note, if you are arriving by car using GPS and having problems, please stop at the COSMO gas station in Kurokawa (route 442) and phone us from there. 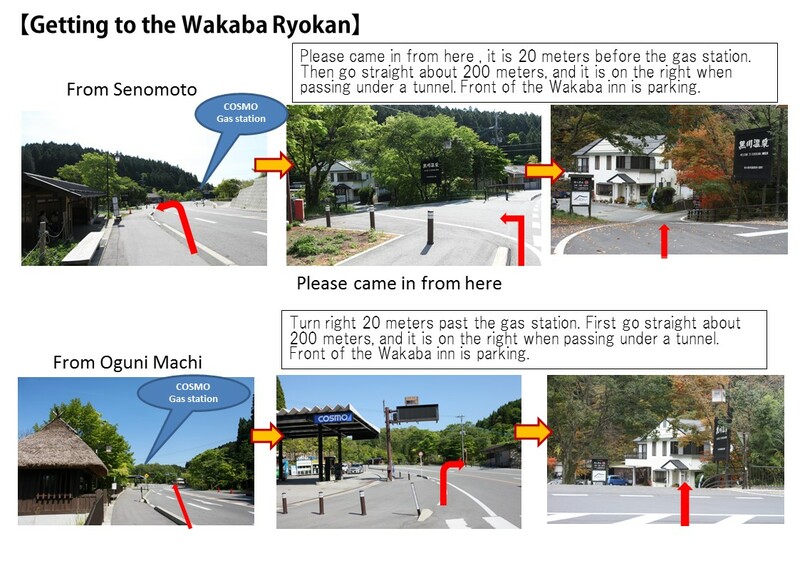 Wakaba Ryokan is only 2 minutes from there. To Kurokawa Onsen from Kumamoto Sta. 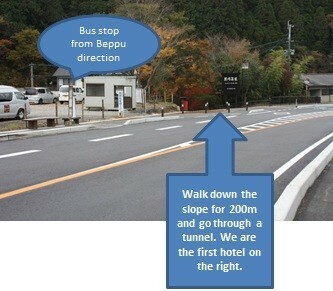 ※We are about 2 or 3 min walkfrom the bus stops. If you give us a call in advance, we can pick you up at either bus stop. Fly to Fukuoka Airport or Kumamoto Airport. 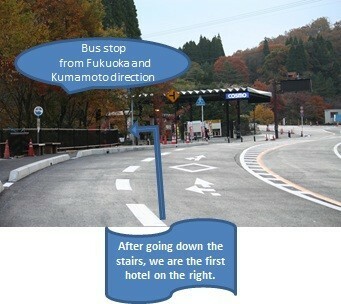 From Fukuoka Airport, take a bus and change in Hita or Tsuetate Onsen to come to Kurokawa Onsen. From Kumamoto Airport, take the bus bound for Kurokawa Onsen. Please note that after the April 20116 earthquake and July 2017 floods in parts of northern Kyushu, rail services are disrupted. From Fukuoka (Hakata) to Hita -there is currently no service. From Oita you can travel as far as Yufuin by train and then take the Kyushu Odan Bus – reservations advised. Take Kagoshima Honsen Line and via Kyudai Honsen Line. Hakata Sta. → (JR train) → Kumamoto Sta. Take the Houhi Honsen Line. If you go by car or rent a car, it is very easy to go to Kurokawa Onsen and get around the area. From Fukuoka City to Hita IC, about 2 hr 30 min. From Kurume to Hita IC, about 2 hr. From Hita IC, get on Rt. 212. It takes about 1 hr to Kurokawa Onsen. From Kumamoto IC, about 1 hr 30 min. From Kumamoto IC, drive on Rt. 57 to Kurokawa Onsen. From Beppu, about 1 hr 30 min. From Yufuin IC, drive on Yamanami Highway to Kurokawa Onsen.